This past June continued a recent spate of unprecedented heat around the world, as NOAA’s National Climatic Data Center (NCDC) announced it was the warmest June on record (the NCDC’s data extends back to 1880), making it the fourth consecutive month of record heat. The combined global land and ocean temperature for June was 16.2°C (61.1°F), placing it 0.68°C (1.22°F) higher than the twentieth-century average. Remarkably, it was the 304th consecutive month of global temperatures above the twentieth-century average. The last month that global temperatures were below that average was February of 1985. 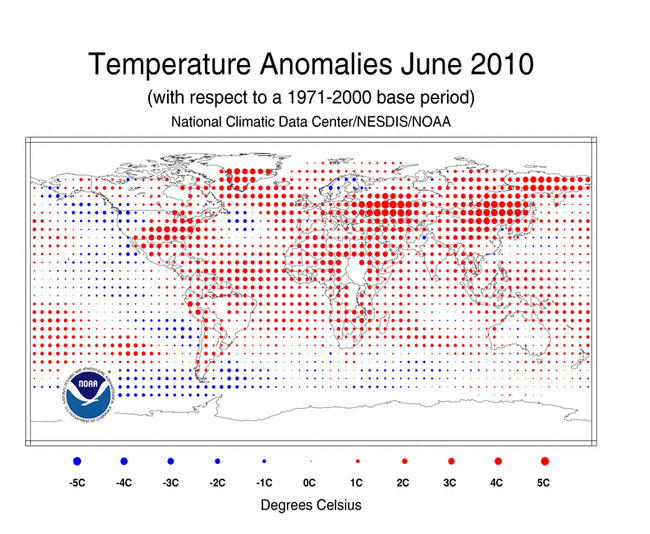 March, April, and May of 2010 were also the warmest of their respective months on record, and the period of January-June is also the warmest ever recorded. With the warmth came a striking decrease in snow, as NOAA announced that North American snow cover at the end of April was at its lowest point for that time of the year since satellite record keeping began in 1967, at 2.2 million square kilometers below average. This was just four months after the snowiest December on record, as well as significantly higher-than-n0rmal snow cover in January and February, demonstrating the profound ramifications of the warm temperatures that followed.